About 25 years ago, the King of Thailand’s mum (known as the Princess Mother) decided to build a summer retreat on the top of Doi Tung mountain in the far north of Thailand. There was a reason she chose Doi Tung; Thailand was trying to convince the local hill tribes to stop growing opium poppies but they really didn’t have a lot of other choices. So the Princess Mum thought, maybe if I have a royal house here and try and help the people, they will stop growing opium flowers. Mum got very involved. She set up schools, clinics, and encouraged funding of new crops to replace the opium growing. It took awhile, but these days the hill tribes are known for their macadamia nuts and coffee (neither of which is indigenous to Thailand). 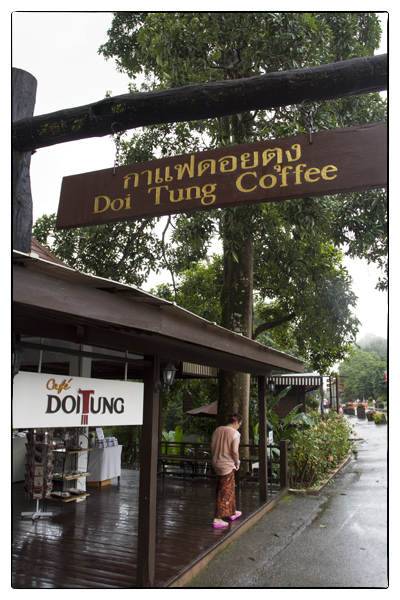 In fact, Doi Tung coffee is now so well known that it’s now sold all over Thailand. This afternoon we made our way up the steep, winding mountain road during a magnificent downpour to visit the Royal Villa at Doi Tung (the Princess Mother died in 1995 at the age of 94). While we waited for the rain to ease up, we had coffee at the Café Doi Tung. If you ask a Thai if Doi Tung is the best coffee in Thailand, they’re likely to tell you it is number one. And then if you ask them if Doi Chaang, another famous brand, is as good, they’ll say, “Doi Chaang number one.” In fact, you’ll probably get the same replay about any Thai coffee. “This is excellent coffee,” I said to Ketsara as we sipped our coffee watching the rain come down. “Maybe the best. Maybe some other.” She said she could think of a couple of other coffees that were as good. I asked her if we were going to be in the areas where those coffees were sold. She thought about it for a minute and then said, “Ye-s-s-s-s-s.” Which means maybe. What it really means is, It wasn’t on the itinerary but let me see if I can make it happen. The rain let up. I paid the bill and bought a bag of just-roasted Doi Tung coffee beans. I told Ketsara that I would also buy Thai coffee beans at the other places and when I got home I would sample all of them and tell her which was the best. I did this to insure that she would find the other coffee stores.